This morning, Benedict XVI dispatched the one of the papal household's longstanding key figures to the side of a favorite of the last pontificate. For the last 11 years, Msgr Mieczyslaw Mokrzycki has served as the deputy private secretary to two pontiffs, first as now-Cardinal Dziwisz's #2 in the reign of John Paul II and, since 2005, alongside Msgr Georg Ganswein, the personal aide the new Pope brought with him. But that ended today, as the Polish-born cleric known as "Mietek" was sent forth from the Apartment with a flourish when he was named coadjutor-archbishop of his home diocese: the Ukrainian outpost of Lviv of the Latins. Forty-six years old, Mietek (shown above with his two bosses on John Paul's 2002 arrival in Toronto for World Youth Day) will eventually succeed Cardinal Marian Jaworski at the head of the local church just over the Polish border. 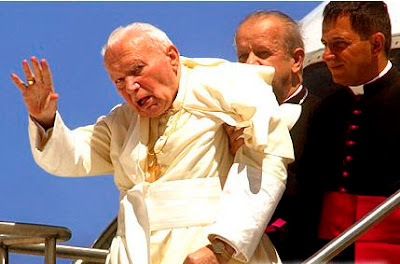 As a courtesy to the 80 year-old cardinal -- a friend of Karol Wojtyla's from their youngest days who lost his left hand in an accident while on an errand for the future Pope -- Benedict has delayed accepting his resignation past the usual threshold. On his trips to Rome during John Paul's papacy, Jaworski was one of a tiny handful of senior prelates who invariably stayed in the papal apartment. As a sign of his friend's loyalty, he was created a cardinal in pectore in 1998, his elevation revealed publicly three years later once political tensions in the Ukraine were deemed to have subsided. Until recently, Lviv was the world's sole home-base of two active cardinal-archbishops; Jaworski for Latin-rite Catholics and Cardinal Lubomyr Husar, the major archbishop of the Ukrainian Greek-Catholic Church. Husar moved his base to the capital of Kiev in 2005. Ordained a priest by Jaworski in 1987, Mokrzycki served as his private secretary for a time before landing in Rome in 1995 as an official of the Congregation for Divine Worship and the Discipline of the Sacraments. Within a year, he was brought up to the papal apartment in the personal service of the Polish Pope. Toward the end of John Paul's days, Mietek became more and more of a caretaker to Wojtyla as the effects of his Parkinson's bore themselves out. His devoted attention to his late boss was said to have moved those who witnessed it to tears, and he's made a habit of keeping in touch with those he's met on papal tours over the years. The Lviv appointment creates an opening for a new deputy to Ganswein; traditionally, the Popes have made use of a tag-team of priest secretaries at any one time. It also marks the departure of yet another John Paul mainstay from the inner circle of the Apostolic Palace; the longtime papal photographer Arturo Mari retired at the end of May. SVILUPPO: While the Holy See wouldn't confirm it, CNS cites reports from the Italian press that Maltese Msgr Alfred Xuereb, currently in the service of the Prefecture of the Papal Household, is in line to take the newly-vacant papal secretary's post. As there's no such entity as the "Office of the Pope," a pontiff's personal aides are accredited to the First Section of the Secretariat of State. Beside Ganswein, at Ratzinger's side since 2003, Benedict's similarly-ranked staffers are the longtime staples of his in-house brain-trust: Ingrid Stampa (who managed his cardinalatial household) and Birgit Wansing. A member of the Schoenstatt community, Wansing was, aside from his priest-secretary, the lone aide the Pope brought with him from the Congregation for the Doctrine of the Faith.